The expansive resort grounds are situated on 250 acres at the base of Camelback Mountain. On-site Jokake Inn, a historic adobe house built in 1926, which became a tea room and then later a hotel, can be seen in the popular 1987 film Raising Arizona. There is a two-acre cactus garden featuring 250 labeled varieties of cacti and succulents. You can stroll at your leisure, or join a tour led by the resident horticulturist. The boutique hotel The Canyon Suites within the resort is one of only 115 Forbes Five-Star hotels in the world. The Phoenician serves a traditional afternoon English tea in the Lobby Tea Court. At sunset on Friday and Saturday afternoons, guests and locals are invited to attend the fascinating Flight of the Phoenix bird show. The Phoenician houses 16 birds of prey including owls, falcons, vultures, and hawks. The luxurious finishes and furnishings include a striking lobby of Carrera white marble, a Serenity Pool lined with shimmering Mother-of-Pearl tiles imported from Italy at a cost of over a million dollars, and 11 Steinway pianos scattered about the property. 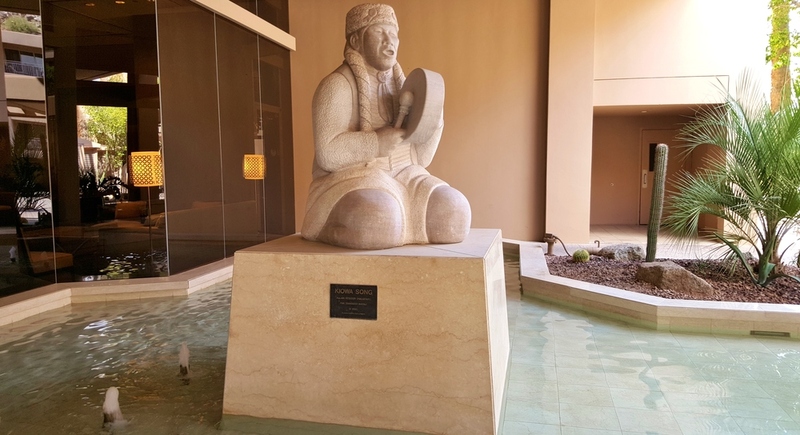 The Phoenician has a multi-million dollar art collection - from French tapestries to Navajo rugs, from watercolor paintings to bronze sculptures - with guests welcome to a self-guided audio tour. Those who take the tour also receive complimentary tickets to the Phoenix Art Museum, a Phoenician partner. Checking in: Lobby sitting room and terrace. We were kindly invited by public relations director Denise Seomin to join her for tea in the elegant Lobby Tea Court. What a relaxing and fun start to a staycation. In fact, my husband was just telling friends about how much he enjoyed it. Thanks to Denise for converting my husband to an afternoon tea fan! That night, we had reservations at Il Terrazzo, The Phoenician's Italian restaurant (open for breakfast, lunch, and dinner). We had dined here once before, and I remember remarking that we needed to get here more often (I recall standout dishes such as tuna crudo with tonnato aioli and veal ravioli with Barbera wine sauce). Our dinner on this evening was no less impressive, as we feasted on chilled tomato and crab soup, Caesar salad with olive and walnut croutons, tender lamb, spring pea cavatelli, delicious snapper, juicy Cedar River beef tenderloin, and ricotta cheesecake with hibiscus caviar. What a perfect ending to our first night. We enjoyed a leisurely morning the next day, skipped breakfast, and started our afternoon with lunch at Relish Burger Bistro overlooking the golf course fairways. Between Denise's and bartender Ruth's recommendations, we weren't steered wrong - the spiked Orange Creamsicle shake with Ketel One Oranje vodka and Grand Marnier, achiote BBQ chicken nachos, crispy fried pickles, the Wagyu beef Cowboy burger with battered onion rings, bacon, cheddar, pickled jalapenos plus an optional fried egg, and a decadent short rib burger stacked with tomato-mustard jam, boursin cheese, tomato, and arugula on a sourdough bun. After lunch, we admired the scenery as we strolled over to the Mother-of-Pearl pool to spend the afternoon. The beautiful setting was made even more special as we were greeted by Cabana Captain Rich Whalen with "Let me show you to your cabana and can I make you a Negroni?". It doesn't get much better than that, until he tells us that we're in time for Cookie Hour (or in this case brownies). After soaking up some sun, I had made plans to meet a girlfriend for Happy Hour at the Thirsty Camel and the Flight of the Phoenix bird show. A bonus at the Thirsty Camel is that you may find one of the best cocktails masters in Phoenix - Robert Porter- behind the bar mixing up your drink. We found seats on the picturesque terrace as we listened to the tale of the mythical Phoenix and were introduced to some of the amazing birds that live on property - Archemedes, an eagle-owl, Zopilote Rey, a South American king vulture, and Chula, a red-tailed hawk. A wonderful surprise was running into the two talented photographers who collaborate on the features found on this site - Debby Wolvos of DW Photography and Jenelle Bonifield of Food & Lifestyles. Negronis for everyone! Our final dinner was at J&G Steakhouse with its panoramic views, where we dined on a few of my favorites. I love the black truffle cheese fritters, Dover sole à la Grenobloise with brown butter and capers, and sides of creamed spinach and Comté cheese potato gratin (the best gratin in town in my opinion). Delicious food, fantastic service, and a stunning setting - a wonderful last night of our staycation. After packing up the next morning, we headed to Café & Ice Cream Parlor. For breakfast, we each ordered a flaky chocolate croissant and then a breakfast burrito for my husband and an ice cream for me. I was happily surprised to see The Phoenician carries one of my favorites - Sweet Republic, an award-winning local artisan ice cream. I had to get the Phoenician Crunch, of course. As we prepared t check out, I read that there was a complimentary sangria class. Needless to say, we decided to have our bags held and stay a little longer for an informative lesson on sangria-making with recipes and accompanying tapas of gambas al ajillo, gazpacho, and chorizo-stuffed, bacon-wrapped dates. Afterwards in the lobby, we ran into Robert, who told us in half an hour he was teaching a cocktail class at Grape and Grain. Alas, I couldn't talk my husband into staying even longer. Perhaps he was worried I would never leave. Farewell to The Phoenician for now, but we'll be back. And I still have the spa, cactus garden, and artwork to explore. I was hosted by The Phoenician and our stay was complimentary.